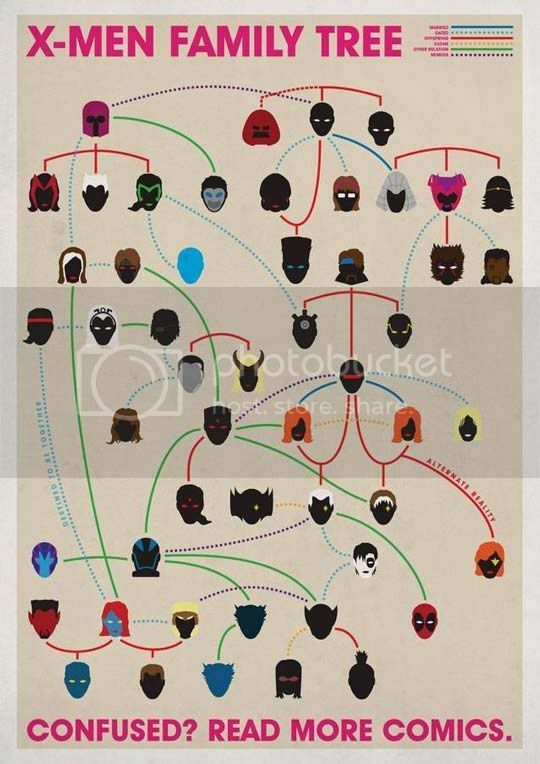 Found this lying around the interwebs, it's supposedly an infographic showing how each character is related to the X-Men. Unfortunately you have to figure out the lines and relationships yourself because I can't seem to find a larger version that would let me read the meaning of the lines. If you happen to have the programs used in CSI that sharpens any image regardless of the original file's size please do let us know what it says. I really need to read a lot more comic books as I barely can recognize the heads on the family tree. The program used in CSI is bogus by the way. You can check the whole image after the break. Thanks to reader @chiccosci and his bionic eyes we now have the legend of the lines.